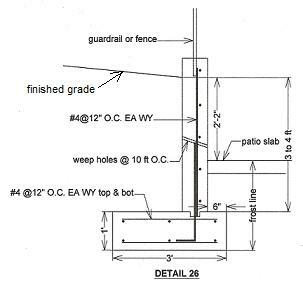 How deep and wide should the footing be to act as a wall retainer for a patio in Chicago? If I understand your question correctly, I believe you're looking for a concrete retaining footing detail. The retaining wall Detail 29 below show how the footing look relative to the stem wall. The footing width of retaining wall depends on the height of the soil you need retained. As shown below, the footing width is almost the same as the height of the wall. The wider footing helps stabilize the wall when the soil and water pressure start to buildup on the side of the wall. Most retaining wall footings are at lease 12 inches thick and they all have rebar reinforcements on both top and bottom. As soil pressures buildup against the wall, the wall will lean towards the side with less soil, from detail 26, it will leans from left to right. This will cause the footing to bent downwards causing the top of the footings to be in tension thus the rebar on top. Any load such as vehicles parking on the left side of detail 26 or a building built near the retaining wall just left of the stem wall will cause a lot of soil pressure against the retaining wall. This type of loading will require a much wider footing to resist. Should be the case in your project, you need to have a license structural engineer to design the stem wall and footings for you. Retaining wall is one of the structures that require a licensed structural engineer involvement especially if its over 4 feet high. You might need to contact your local building department to find out retaining wall requirements in your area. From your local building department, they will be able to tell you the depth for the frost line shown in detail 26.